Step inside a brainstorm session at Mattel headquarters, courtesy of SNL. Pitching ideas for a doll’s Instagram caption sounds like easy work, right? Wrong. 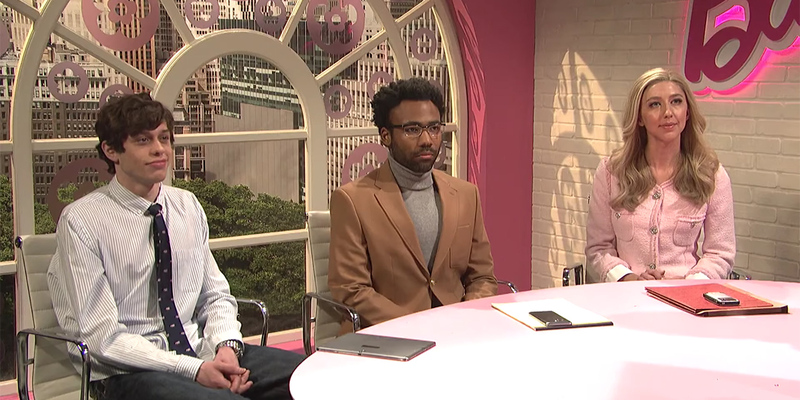 This weekend Saturday Night Live stepped inside a Mattel boardroom in a hilarious sketch with actor, singer, director (and this weekend’s host) Donald Glover. In the sketch, Glover plays an intern in the social media department for Mattel brand Barbie. He and fellow interns (played by Pete Davidson and Heidi Gardner) are tasked with presenting ideas for three separate Instagram posts to go on Barbie’s personal page. The shots are pretty standard—Barbie in her room, perfectly posed and sitting next to her dog, or Barbie out an about, sipping a trendy beverage and holding her cute clutch that sort of looks like a chocolate bar. What exactly is Glover referring to? Well, that time Barbie was standing outside of her dream house and saw some girl get hit by a car, because perfect Barbies can witness traumas too. Glover’s commentary is pretty hilarious and absurd—almost as absurd as Barbie having her own regularly updated Instagram account. It provides a nice reminder that not everything is as perfect as it seems on social media.